We all know the benefits of eating oatmeal in the morning but we seldom eat it because it’s tastes boring. Although I try my best to make it more appealing especially to my kids like putting Bananas, Craisins and raisins in their breakfast bowls or baking it into my chocolate chip cookies. My kids and husband love lugaw in the morning or as merienda but since we stopped eating white rice and have shifted to the healthier brown, red or black rice, we have also stopped cooking Arroz Caldo. 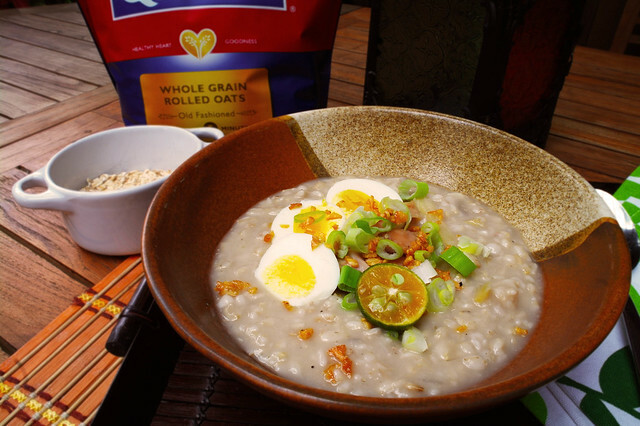 Here is a recipe I came up with that will make everybody happy – me, in my quest to serve them low calorie but high-fiber, and good for the heart oatmeal, and them for their love of the Filipino favorite rice porridge, Arroz Caldo. In the same pot, sauté half the garlic until golden brown for toppings, set aside. Pour the rest of the olive oil and sauté the remaining garlic and ginger. Add the oatmeal and sauté until grains are coated with oil. Pour the 2 liters chicken broth. Add chicken pieces and season with patis to taste. Allow to simmer until the oatmeal and chicken are fully cooked, about 30 minutes. Add more broth to achieve your desired consistency. The porridge should still have a soupy consistency when cooked as the oats will continue to absorb the liquid as it cools. Serve in bowls topped with browned garlic, spring onions, slices of hard boiled egg. Serve calamansi on the side to taste. So how did you find it? Let us know in the comments down below! Tags: Arroz Caldo, Congee, Cook, Filipino, Healthy, Oatmeal, Recipe, Rice. Bookmark the permalink.